The Theme of Othello research papers discuss Shakespeare's Literature. Discuss the author’s effectiveness in conveying his ideas. Use various sources to back up your ideas. Discuss theme in Othello. What is the main theme? How is it developed? Is Shakespeare effective in conveying his main points? Is the same theme explored in different ways in different works of Shakespeare? How does form impact meaning? How does performance affect how we approach a play? How does the poetic form restrict and/or enhance meaning? How are even personal writings fictionalized. Shakespeare's Othello is a play that is brimming with symbolic meaning. Othello is concerned with several themes, including jealousy, deception, and love. In each of these themes Shakespeare offers a struggle between opposite forces such as good and evil and appearance and reality, and black and white. 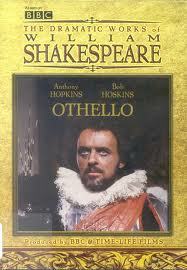 A good research paper on the theme of Othello will examine the symbolism of black and white Shakespeare's Othello. On a basic level, the use of color also symbolizes the attraction of opposites, as demonstrated by the mutual love of Othello and Desdemona. In another sense, Othello's blackness is a visual symbol of Desdemona's unique choice of husbands. On a deeper level, Othello's darkness and Iago's whiteness show that appearance is often much different than reality. While Othello and Desdemona are opposite colors, they share a great deal of common feelings. Similarly, while Othello is dark-skinned, it is the white Iago who is the play's embodiment of evil. Romeo and Juliet and Othello - Romeo and Juliet and Othello research papers compare the similarities between the two classic tragedies. Othello's Tragic Downfall - Othello's tragic downfall is part of Shakespearian typical tragic downfall literary tool. Othello, The Moor - Othello, The Moor research papers discuss the origins of the character Othello. Plagiarism free papers can be bought custom written at Paper Masters. Shakespeare's Plays - Shakespeare's Plays Research Papers discuss his most well known plays. How to Write a William Shakespeare Biography - Use this outline to learn how to write a William Shakespeare Biography. Biography of William Shakespeare for Literature - Biography research papers on William Shakespeare begin with noting that William Shakespeare (1564-1616) was a great English playwright and poet. William Shakespeare Much Ado About Nothing - William Shakespeare Much Ado About Nothing Research Papers delve into an order placed on a film with specific questions to be answered. Comedy of Errors - In a research paper about The Comedy of Errors, the writers at Paper Masters state that William Shakespeare presents his readers with an uncommon worldview. Shakespeare Quotes - Shakespeare Quotes essays examine the many famous quotes from the writings of William Shakespeare. William Shakespeare's Monologues - William Shakespeare's Monologues custom writings examine the well known monologues from Shakespeare's plays. Henry IV - Research Papers on Henry IV by William Shakespeare summarize Shakespeare's story. Richard II - Richard II Research Papers examine Richard II by William Shakespeare. Taming of the Shrew - Taming of the Shrew research papers by William Shakespeare are plagiarism free and custom written. Hamlet - Research papers on Hamlet by William Shakespeare can be ordered to be custom written by professional academic freelance writers from Paper Masters. Shakespeare Twelfth Night - Shakespeare Twelfth Night research papers analyze one of Shakespeare's better-known comedies that involves the fantasy of mistaken identity and romance with a Christmas holiday setting. As You Like It - As You Like It Research Papers delve into an order placed on an analysis of Shakespeare and also to view his performances with a critical eye. Measure for Measure - Measure for Measure research papers examine one of Shakespeare's problem plays that entails both comedy and tragedy. Love's Labour's Lost - Love's Labour's Lost research papers examine the early comedy written by William Shakespeare. The Merry Wives of Windsor - The Merry Wives of Windsor term papers examine the comedy written by William Shakespeare that was first published in 1602. Linguistic Intelligence - Examples of famous people with linguistic intelligence are Maya Angelou, William Shakespeare, Abraham Lincoln, and Martin Luther King Jr. The Merchant of Venice - Merchant of Venice essays overview one of William Shakespeare's most famous comedies. Elizabethan Life - Elizabethan Life is examined as witnessed in the play Midsummer Night's Dream. Two Gentlemen of Verona - Two Gentlemen of Verona essays examine one of Shakespeare's weakest plays. Macbeth - Macbeth is one of William Shakespeare's most famous tragedies. Order a research paper on Macbeth from Paper Masters. Paper Masters writes custom research papers on The Theme of Othello and discuss Shakespeare's Literature.